In 1891 a Warren Pennsylvania concern purchased property from the estate of Mary Prendergast for the purpose of creating a summer resort. The property located on the southside of the southeast tip of Chautauqua Lake New York, known as Prendergast Point, was renamed Celoron in memory of the French explorer General DeCeloron. 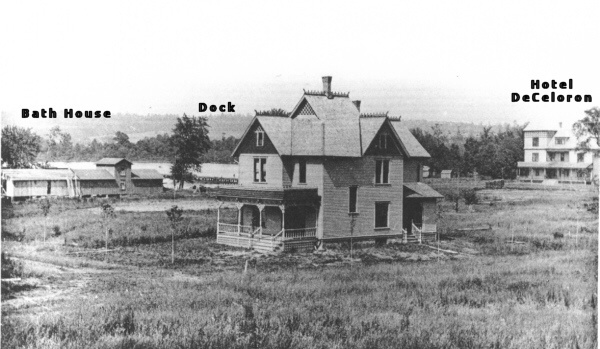 By 1893 a steamboat dock, a toboggan slide down to the water, bath house and the Hotel DeCeloron had been built. It was fast becoming a popular destination for swimming to those nearby. The Jamestown Street Railway trolley car line began providing transportation service to the area and also leased all of the lake front including the park, by now popularly known as Celoron. By September of 1893, the Jamestown Street Railway was on its way to creating what would come to be known as the Celoron Amusement Park. Setting in motion a "roller coaster ride" of events ending when the park was dismantled in 1962. BACK TO GREATER JAMESTOWN NY HISTORY PAGE.